Muslim preacher Mohamed Abdullah al-Nasr was sentenced to five years in prison by a North Cairo misdemeanor court on Sunday for contempt of religion. The charges against Nasr – who is popularly known as Sheikh Mizo – stem from comments he made on his Facebook account and in other media outlets that question literal interpretations of religious texts. Nasr’s lawyer filed an appeal against the verdict on Monday. However, his client will remain in prison pending completion of the appeal process, which is scheduled to begin on March 8. Media outlets have reported that Nasr began a hunger strike on Sunday to protest his imprisonment. Nasr prompted controversy for comments on his Facebook account last year, in which he claimed to be the Mahdy, the figure Islamic scripture states will be the redeemer of Islam and will rule for a period of time before the Day of Judgment. The preacher also impugned the authenticity of some hadiths contained in 9th century Islamic scholar Imam Mohamed al-Kukhari’s Sahih al-Bukhari, one of the six primary collections of the words, actions and habits of the Prophet Mohamed that circulated orally before being codified generations after his death and are integral to Islamic jurisprudence. The five-year prison term is the maximum penalty allowed for violation of Article 98 (F) of the Criminal Code, which pertains to contempt of religion. The article sets a minimum prison term of six months and maximum term of five years in addition to a fine of LE500-1,000 for offenses that promote extremist ideas, sectarianism or contempt that aims to harm national unity. In an interview with TV host Wael al-Ebrashy last year, Nasr defended his comments as aiming to prompt critical engagement with religious texts, saying that he had not seriously claimed to be the Mahdi. The preacher asserted that he hoped the faithful would be able to think critically and question the concept of the Mahdy, as much as the traits associated with the savior to avoid being misled. Lawyer Samir Sabry, a known government supporter, filed the lawsuit against Nasr several months ago. Sabry has filed scores of lawsuits against critical and independent voices in Egypt, calling for authorities to revoke Egyptian citizenship from opposition figures, while also demanding the closure of media outlets associated with the Muslim Brotherhood and accusing Egyptian Shia preachers of blasphemy against the Prophet Mohamed and his companions. In January 2016, the poet Fatima Naoot was sentenced to three years in prison for contempt of religion and insulting the Islamic faith, in connection to comments she made regarding the ritual slaughter of livestock during Eid. Naoot subsequently appealed the verdict and was acquitted. 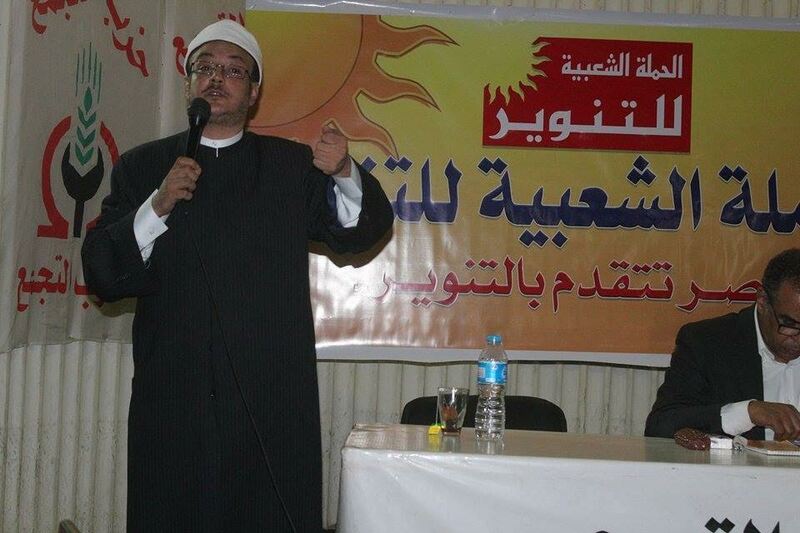 The Muslim preacher and TV host Islam al-Beheiry was sentenced to prison in 2015 for comments he made on his show against the literal interpretation of Islamic scripture. Beheiry remained in prison until November 2016, when he was granted a presidential pardon. While Egypt’s Criminal Code stipulates penalties for blasphemy and contempt of religion, Article 64 of the Constitution guarantees absolute religious freedom, while Article 65 safeguards freedom of thought, expression and opinion. Mai Shams El-Din | Anger over the decision to unify the Friday sermon has extended to Egypt’s Al-Azhar religious institution.